Baker Mayfield is fighting the critics on whether he can be a top QB in the 2018 NFL draft. Does his scouting report back that up? Led his high school team to the state championship in Texas. That’s kind of a big deal. He initially enrolled at Texas Tech. However, disagreements with the coaching staff over the starting job led him to being transferred to Oklahoma in 2014. He became the starter in 2015 after winning an open competition and never relinquished the job. A good athlete with mobility. Finds a way to wiggle out of trouble and can take off running for first downs. Not a sprinter but can’t be ignored as a runner. Solid arm strength. Demonstrated on multiple occasions that he can cut it loose down the field with enough velocity to hit receivers in stride. Make no mistake. Mayfield has the look of a gunslinger who is going to cut it loose down the field when he gets an opportunity. This video showcases both his good enough arm strength and underrated deep ball accuracy. He rolls out to the left, does well resetting his feet and then fires it almost 60 yards through the air and hits his receiver in stride for a touchdown. Pretty. Shows quickness to get the ball out fast. No extra time taken when having to get rid of it. Serves him well when pressure is in his face. Accuracy and ball placement show up even when he’s on the run. Does a good job of not forcing his receivers to constantly adjust to the football in flight. Doesn’t lack for toughness. Took some pretty nasty shots in some games and kept getting back up for more. Teammates will approve of that. Can deliver some camera-juking pump fakes, indicating he likely has big hands. That will explain how he’s able to deliver the ball so well. Lack of size is going to be a concern. Though not extremely short, he’s giving up vital inches that will make vision and healthy primary questions at the next level. Somewhat reckless at times with his decision-making. Will throw into tight coverages, trusting in his accuracy that will lead to interceptions in the NFL. This is the Good Baker, Bad Baker situation. Mayfield is so good at keeping plays alive with his feet but he also doesn’t understand the value of living to fight on the next play. He tries squeezing the ball down the field to a receiver who is clearly well-covered and he ends up paying the price with an interception and big return. Has lived in the shotgun his entire college career. Played in a classic spread offense with the Sooner. No idea how to play under center or take drops. Can have a bad tendency to hold the football trying to keep plays alive. Opens him up to frequent hits and also fumbling the football. People forget that he was still considered a 1st round pick even with his off-the-field baggage. Nonetheless Manziel clearly was a gifted playmaker who could win throwing and running. 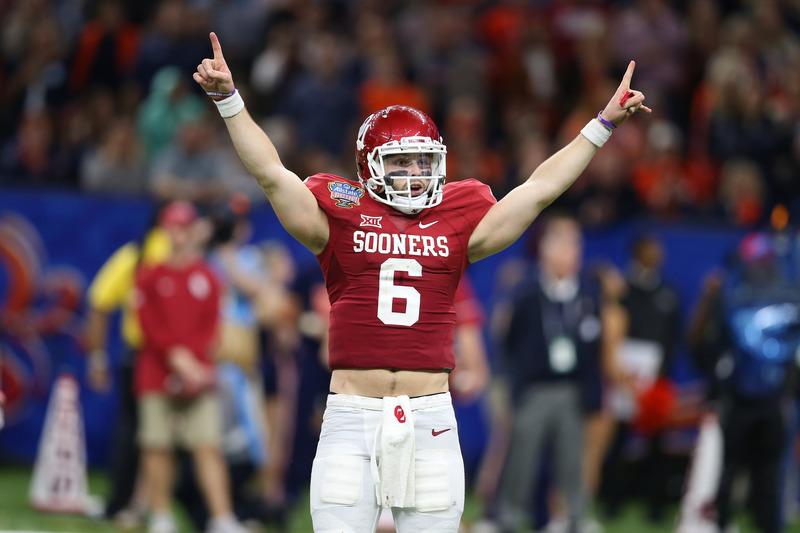 Mayfield is built just like him from the undersized frame to the mobility to the strong arm and solid accuracy. Heck even their uniform colors are similar. The difference is Mayfield doesn’t have near the character red flags. People will see that same comparison too and likely it will hurt Mayfield’s stock. Truth is the size questions won’t help either. He’s been productive enough and has some good tape to work with. He feels like the perfect mid-round gamble who could end up becoming a starter if he finds the right system that can utilize his strengths and hide his weaknesses.